There are three operations making rum in Grenada – Westerhall, Rivers Antoine and Clarke’s Court, the last of which was formed in 1937, operating under the umbrella of the Grenada Sugar Factory (the largest on the island) and named after an estate of the same name in the southern parish of St. George’s. This title in turn derived from two separate sources: Gedney Clarke, who bought the Woodlands estate from the French in the late 1700s, and a bay called “Court Bay” included with the property (this in turn was originally titled “Watering Bay” because of the fresh water springs, but how it came to change to Court is not recorded). The company sold rums with names like Tradewinds and Red Neck before the Clarke’s Court moniker became the standard and I’m still trying to find out when that happened. 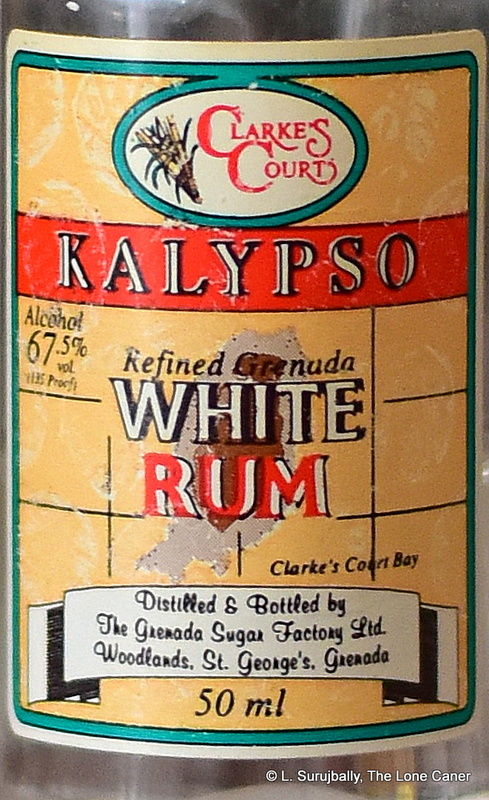 References to Kalypso, a 67.5% white overproof, exist until the late 1990s when it was marketed concurrently with the 69% Pure White Rum, but I can find no trace subsequent to that, and the company website makes no mention of it in the current lineup of their rums. So I am assuming (subject to further info becoming available) that the two were similar enough in profile and strength for the production of the Kalypso to be discontinued in favour of the better known and maybe better-selling Pure. The rum is unaged and column still produced (the current distillery was constructed in the 1970s and utilizes a John Dore two-column, continuous-distillation still). Nose – Sharp and very aggressive, not surprising for that strength. Also quite aromatic – esters, and nail polish, strawberries, pears and sour cream, to begin with. It smells rather lighter than it is, and sweeter than it tastes, which is nice. Leaving it to open up results in additional smells of sugar water, nutmeg and the slight bite of ginger. Palate – Whew. Pungent is the word to use here. Some plastic and furniture polish, a little brine. Most of all the light clear sweetness from the nose comes through and remains firmly in place – pears, watermelon, white guavas, papayas, with the spiced notes of nutmeg and ginger also remaining in the profile. Finish – Hot and long lasting of course, no surprises there. Mostly light fruit and some aromatic flowers. Thoughts – The Kalypso lacks the fierce individualism of pot still whites and really doesn’t class with the same company’s Pure White Rum which is an order of magnitude more pungent. But it’s not bad, and taken with coconut water, bitters, cola or whatever else, it’ll juice up a mix with no problems at all, which is hardly surprising since that’s precisely what it was made for. Too bad it’s no longer available.